Would you like to live forever? Well if you are a special type of jellyfish you could. 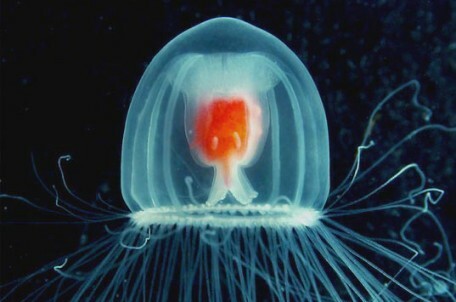 Turritopsis nutricula, is the only animal known to be potentially immortal. Turritopsis is a jellyfish-like hydrazoan, with some very strange life skills. It starts life as a stalk like polyp then when it reaches sexual maturity it is a many tentacled organism that floats freely in the ocean but it also has te ability to turn into a blob, anchor itself to a surface and revert back to its youthful form of a polyp. Scientists believe it can repeat this life cycle indefinitely, and hence live forever, that’s presuming it doesn’t get eaten! Turritopsis achieves this remarkable reverse metamorphosis by a process called transdifferentiation, which turns one type of cell into another. Other animals, like salamanders can regrow legs by limited transdifferentiation but the Turritopsi is the only animals known to have the ability to regenerate its entire body. Not surprisingly, numbers of the immortal Turritopsi are increasing.Native to Caribbean seas, they have now been found in waters near Spain, Italy, Japan, and the Atlantic side of Panama. Wow! I can honestly say that I’ve never heard of this one before! Thanks for sharing, as this makes me want to research further about the immortal jellyfish!